October 2, 2013 by beWARM. 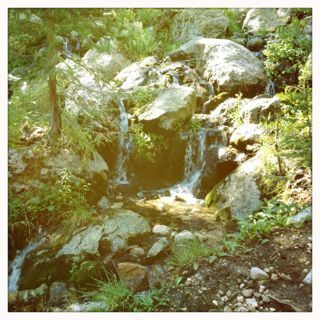 All the elements of a glorious hike in Taos this past weekend. We chose the trail on the spur of the moment, intrigued by the name…Italianos Canyon. Laughingly, we wondered if we should have packed some pesto salad for lunch, along with a swig of Chianti. Alas, our trail mix and bananas would have to suffice. A few switchbacks and flat sections brought a brief reprieve. When we had seven tenths of a mile to go, we agreed to forge on. Thankfully, the path was always obvious, with no intersections requiring the question of which is the right trail. Traveling on a path that is clearly defined, when hiking, is a pleasure. in life, most of the time we have the opportunity to choose our pathways. Sometimes, though, our circumstances bring us to places that are not of our choosing – and where there are no forks in the road. How then do we navigate? We all know someone who is on such a journey; a person facing a round of chemotherapy, parents grieving the loss of a family member, a relationship, or a job. If any of them could wish for an optional route that would rewind their life, they surely would take a different option. Each of us has faced a “no-choice” situation at one time or another – and somehow, we have endured. Having God alongside has certainly helped. For those we know whose circumstances are unalterable, let’s hold them close in thought and prayer, and hope that they somehow will feel His presence in their lives. Amen to this, Toni – every step of the way…..!! Thanks, Toni, once again for your insight. “I am always with you” is such a comfort no matter the path on which we find ourselves. God bless your day! Oh, Toni, thank you for this! Grieving with folks, crying with them, being God’s right hand, you teach all this. Have you seen “Walking with God through pain and suffering? New book out Tuesday by our pastor in NYC…so far so very good. on October 6, 2013 at 9:12 pm | Reply beWARM. I haven’t seen the new book…but will take a look at it. Sounds wonderful, Mary Jane!